In sixth century BCE, the modern day hero and time traveler, Evan, continues his quest to recover three relics of the Mother Goddess, so that the new Christian religion does not obliterate the worship of the Olympian gods. 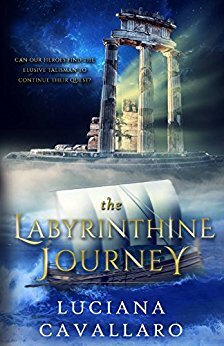 The Labyrinthine Journey, the 2nd book in the Servant of the Gods series by Luciana Cavallaro, has an epic mythological quality similar to Ulysses in Homer’s Odyssey. Evan, also referred as Evandros, embodies Joseph Campbell’s archetypal hero found in world mythologies. In Book 1, Evan reluctantly accepts the call by his father Zeus to travel back in time from 21st Century to Ancient Greece, so he can use his skills, insight, and knowledge to recover the first relic, the golden serpent. In the Labyrinthine Journey, Evan embraces his leadership role and commands a group consisting of a Phoenician, a Sicilian boy, Atlanteans, and a High Priestess who are also on the quest with him. He learns from the Oracle of Delphi that he can find the two remaining relics in the Minotaur’s labyrinth. The journey to recover these relics is fraught with dangers from hostile armies, Titans seeking to thwart Zeus, and mythological creatures such as harpies, a hydra, and a sea monster. Evans meets Jason of the Argonauts and Plato who both help him on his quest. The odyssey culminates in a cliffhanger where Evan must face his greatest obstacle that threatens to obstruct his goal of retrieving the relics. Luciana has masterfully crafted a story that weaves mythology into the backdrop of historical events. The action scenes are riveting, particularly toward the end of the book. One of the aspects I liked most about the novel is the vivid, sensory description of each of the locations. As with any myth, The Labyrinthine Journey is more than what you see on the surface. It is an exploration of how humankind adopts religion to meet their needs and to help them define their culture. Evan’s modern day perceptions are challenged by the ancient traditions. He must adapt to these ancient beliefs to survive. Ultimately, it is a universal story of a hero’s journey into his soul and the wisdom he gains by meeting the various challenges. I highly recommend this book for readers who love adventure, historical fiction, and mythology.